Class told, the top four seeds in the Boys’ Singles event at 2018 Pan American Junior Championships in Santo Domingo, Dominican Republic, all reserved semi-final places following success on Saturday 14th July. Kanak Jha and Sharon Alguetti of the United States both advanced in style as did Chile’s Nicolas Burgos and Brazil’s Guilherme Teodoro. The fact that all four now have considerable experience of playing beyond the shores of the American continent was undoubtedly a telling factor. Impressively, Kanak Jha, after accounting Argentina’s Leandro Fuentes, the no.9 seed (11-6, 11-2, 11-7, 11-7), overcame Peru’s Rodrigo Hidalgo, the no.15 seed (11-6, 11-2, 11-7, 11-7), the winner one round earlier in opposition the only player, who in the main draw of the Boys’ Singles event, raised eyebrows. 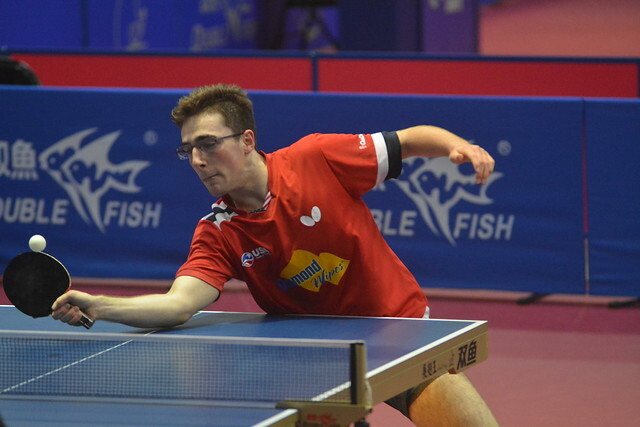 He beat Peru’s Felipe Duffoo, a young man whose name does not appear on the current Under 18 Boys’ World Rankings. In the opening round he caused quite a stir by ousting Brazil’s Eduardo Tomoike, the no.6 seed (13-11, 8-11, 13-11, 12-10, 9-11, 10-12, 11-6). Otherwise, matters advanced very much according to plan. Sharon Alguetti, the no.2 seed, reserved his semi-final place by defeating Canada’s Jeremy Hazin, the no.7 seed, in what was to prove the most highly contested of the four quarter-finals; a six games verdict was the end result (7-11, 14-12, 11-5, 4-11, 12-10, 11-4). Testing times for Sharon Alguetti, life was less dramatic for Nicolas Burgos, the no.3 seed and for Guilherme Teodoro, the no.4 seed; both recorded quarter-final wins in opposition to Argentine adversaries. Nicolas Burgos defeated Martin Bentancor, the no.5 seed (11-4, 11-9, 11-6, 11-7); Guilherme Teodoro ended the aspirations of Santiago Lorenzo, the no.8 seed (11-8, 12-10, 3-11, 11-8, 11-3). At the semi-final stage, Kanak Jha meets Nicolas Burgos, Guilherme Teodoro opposes Sharon Alguetti; play concludes in Santo Domingo on Sunday 15th July.